Are You Ready to Start Dating Intentionally? 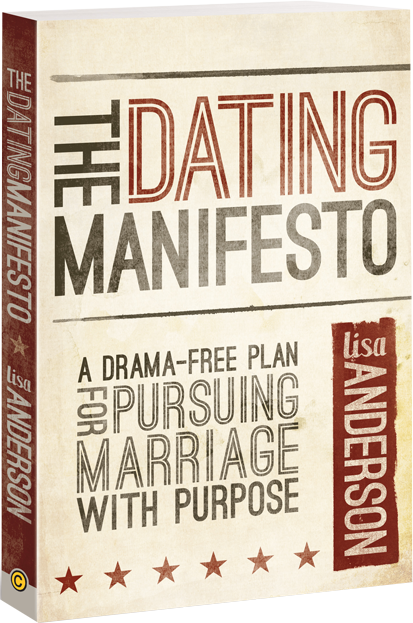 Take the FREE 7-Day Dating Challenge, based on Lisa Anderson’s book The Dating Manifesto. What if the Advice You’ve Been Given is All Wrong? Finally, a no-holds-barred word on dating, preparing for marriage and maximizing singleness from someone who’s actually living it. This wake-up call for single men and women cuts through the clutter to expose the attitudes and actions that keep them from moving toward marriage with purpose. If marriage is in your future, the time to start thinking about it is now. But you need to break the bad dating habits that are keeping you stuck. The Dating Manifesto cuts through the clutter to get you on the path to marriage with maximum purpose and minimal drama. Write a review of The Dating Manifesto on Amazon!